【Maximum Comfort and Protection】 Our Expressly contrived inner training gloves deliver quality protection and are exclusively designed to offer flawless comfort and fitting. It additionally aids in solid knuckle guarding. A thumb hole for added security. These inner gloves are splendidly comfortable for any hand size. 【Thermal Regulation Technology for Sweat Wicking】 RDX training inner gloves are equipped with matchless thermal regulation technology that ensures you liberate the fighter within you while sogginess runs far away. Your palms remain dry and odor less. It disregards moistness and wicks away wetness thus, you stand hygienically clean. 【Shell Shock Absorbing Padded Knuckles】 RDX Gym Inner gloves are extremely compact and Shell-Shock absorbent padding provides premium impact opposition. It shields the knuckles and delivers robust shock absorption. Highly compressed super shock padding, guarantees the supreme volume of force to be distributed evenly through fine support. 【75cm Long Wrap around Cotton Bandage with Hook-and-loop Closure】 Our inner gloves come with improved 75cm long Quick-EZ hook and loop that ensures a securely snug fit and backs the wrists. With the long cotton bandage, the gloves do not slip while striking. EZ closure design also assist in wrist alignment. 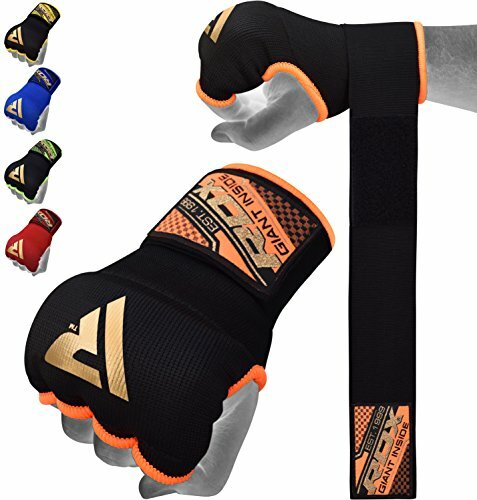 【Woven Carbon Fiber Fabric】 RDX Boxing Inner gloves are made with Lightweight Woven Carbon Fiber fabric that offer better for split, tear and crack resistance. This material is more rigorous in training and last for a very long time. The construction is sturdy and durable without being too stiff. They're nice and light which makes protection solid and compact.